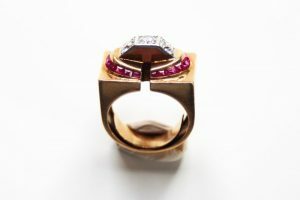 1940 TANK ring with diamonds and synthetic rubies. Sometimes my eye is caught by a very strong design, that is so appealing that I can’t go by it without touching it, louping it, putting it on and in the end buying it. And sometimes I ignore the fact that the design is set with synthetic stones. In this case this very 1940s TANK*ring. The ring is set with 3 brilliant cut diamonds that are accentuated by a row of synthetic rubies. I think there is still a taboo on synthetic rubies and sapphires. Why is that? Costume jewelry is widely accepted and in most cases not cheap at all (think Chanel in the 1920s). Another example are glass and pastes look-a likes, they were popular for centuries. 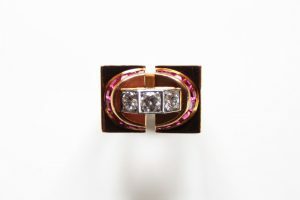 But when it comes to high end jewelry were natural stones are combined with synthetics it raises some eyebrows. Synthetics came in use after the war, although the French chemist Auguste Verneuil already invented the stones or better to say the process of flame fusion, in the 1890s. After the war natural stones were rare and synthetics were cheap and available. Rubies were the most popular gemstones of the 1940s period. Partly because they went well with pink gold and partly because of their warm feminine colour. Smaller stones could be used to great effects. At this time synthetic stones were widely used and mixed with precious gems to create great colour effects or to accentuate, like in edges, ridges and on the side. So when you come across a piece of period jewelry with synthetic rubies or synthetic sapphires it is not to con you, but this was a logic and deliberate choice of the goldsmith or designer of that time. *The description TANK in capitals is a referral to Machine Age Jewelry, a whole different chapter. More on TANK jewelry coming soon. This entry was posted in What's new & Jewelry storytelling and tagged synthetic rubies, TANK on 18 September 2016 by Lara.